Happy New Year, sweet friends! how was your celebration? what did you do?! ours was pretty chill. we had my parents over for a little bit of noshing, then watched the ball drop on the east coast (9pm here on the west coast), so we were in bed by about 10pm. ha! so is life when you have a little munchkin who wakes up early 😉. but what i resolve to do this year is make this space more of a conversation, a community. you have listened to me talk for 5 years about my life, my husband, my home, my thoughts/ideas, etc. i want to hear about you! i want to get to know you better. what you want to see more, or perhaps less of. what kinds of recipes you want to see moving forward. what you struggle with. i am here with an open heart and ears. it would awesome if you could take a couple minutes to fill out this **QUICK POLL** so that way we can get the convo started and i can create content that we all have enthusiasm for, and that can facilitate meaningful conversation about your needs and desires! i'm so excited for this year, you guys! it's going to be a good one 💕 sending you all big squeezes! there are a couple of tricks to get super crisp roasted chickpeas. 1. drain, rinse and completely dry your chickpeas. it takes a bit of planning ahead to let them properly dry, but it's worth the wait. 2. roast them on a baking sheet - no parchment paper. this seems to crisp them better. 3. serve and eat them pretty much out of the oven. let them cool for 5-10 minutes so you don't scorch your mouth. but they should generally be eaten on the warm side. whisk together the vinegar, mayo, mustard, and coconut nectar until the mayo is dissolved. drizzle in the oil until the dressing is creamy and emulsified. season with salt and pepper and store in a lidded container in the refrigerator until ready to use. preheat oven to 400°F. combine the chickpeas, oil, tamari, garlic powder, salt, and cayenne (if using) until combined. dump chickpeas out onto a baking sheet and cook for 25-30 minutes, shaking the pan every 10 minutes. remove from oven and let cool for 10 minutes. while the chickpea are cooking, combine the kale and brussels sprouts with about 1 tablespoon of dressing and give everything a 3-minute massage, until the kale has softened a bit. then toss in the onion and apple. drizzle the dressing over top and toss everything once more. 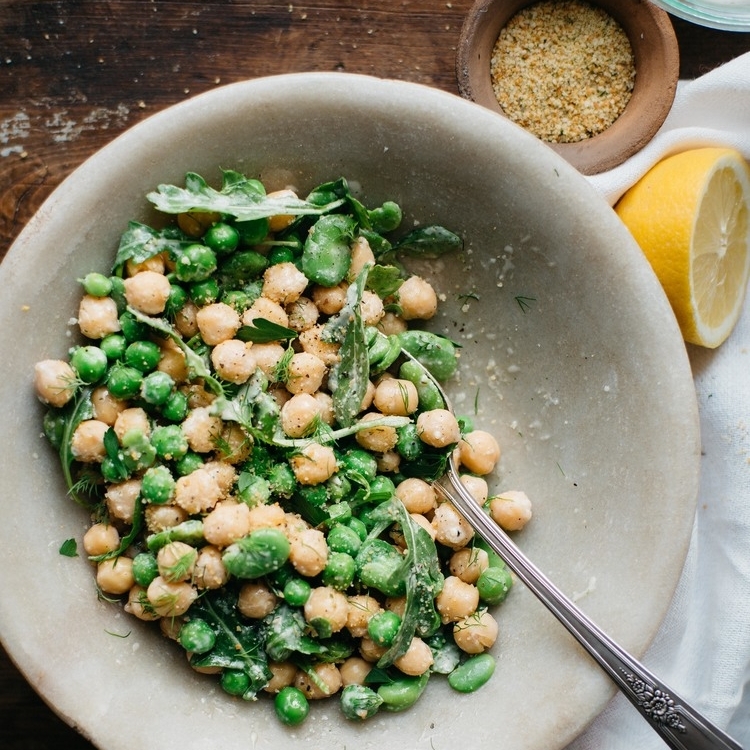 top the salad with the warm garlicky tamari chickpeas and sesame seeds, serve immediately.